When I speak of photography and special places, I often tell people about our twelve day visit to Glacier National Park in northwestern Montana in 1999, and the 79 rolls of film (35mm days) I returned home with from there. But, for sheer volume of images, there is no place on this earth that I have taken more pictures of (or at) than Fitzgerald Park, right here in Grand Ledge, Michigan, just under a mile from where I live. The picture at left, as best as I can discern from my files, is the very first picture I ever took there. It was in January 1987, and I was at the park cross-country skiing. I came to Grand Ledge in 1975 as the new State Farm Insurance agent here. Although we did not move into Grand Ledge as a family until the early 1980s, I most certainly must have been to Fitzgerald many times before January of 1987. However, apparently I did not take many nature pictures during those years. I used a Polaroid in my work, which I believe had been provided by the company. And, I have square pictures of my children from birth throughout their childhoods (my son was born in 1975 and my daughter in 1978) which would likely mean I still owned my little Kodak 126 Instamatic camera which I had in college. But I could not find any photos of visits to Fitzgerald even among those early pictures of the kids. I took mostly slides with that camera, including many in Europe when I spent the summer term of 1969 at the University of Vienna through a Michigan State University program. Perhaps someday I will scan some to do a Scrapbook Photos page about my early photography. I do know I bought what I considered to be my first sophisticated camera (35mm Canon AE-1) after my wife had divorced me. That would have put it sometime in 1986. When I had taken about a dozen rolls of pictures with it, I went back and started a numbering system and my current inventory. The image of the dam at Fitzgerald Park (above right), taken at twilight in August of 1987, was one of the very first images of mine I enlarged as a 5x7 and had available for purchase. The above left picture was taken in October of 1987. It must have been the beginning of October, or the color was a little late that year. Because I have over twenty-one thousand pictures of the park in my inventory to work through, these pages will be done in stages, with a particular theme for each page, or set of pages. The first of these is my 35mm days, and either of the above pictures serves as a (clickable) link to those earlier photos of the park. Although, I was still taking an occasional 35mm picture there as late as 2005. Also, a menu across the bottom of this page gives you options to the various topical opening pages. That first section is simply referred to as "35mm." This photo of the dam (at right) is picture number D006 0001, the first Fitzgerald Park digital camera image in my inventory, taken October 2, 2003. That spot is often the start of fall color for the area. I had recently purchased my first digital camera (a Kodak DX6340), and I have to admit, I was quite surprised at the quality of the pictures. While I have taken any number of superb fall color pictures along this area of the river, I think this next image is the most stunning fall color photo I have ever taken at the dam. I had never seen the constantly flowing water appear so still. I was returning to my vehicle, and had my camera with me, when I noticed the combination of late in the day light, colors, and glass effect of the river. I took 25 shots in five minutes as the light changed, which it rapidly does at that time of day. Having the reflection extend clear up to the edge of the dam is extremely unusual. I had never seen it before, and have not seen it since that day (October 3, 2006). The photo serves as a link to the Fall (Late September thru Early December) Fitzgerald Park pages. As indicated on the above list, the next pages are winter and spring. If you have already visited the 35mm page, you have seen a few shots taken at the same time as the below left photo. I was using both my digital and my 35mm cameras for a couple of years. That image serves as your link to the Winter (Late December thru Early March) Fitzgerald Park pages. 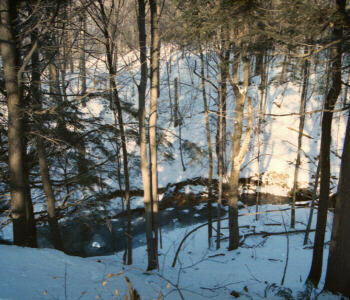 The picture next to it, a favorite early spring spot, takes you to the Spring (Late March thru Early June) pages. Similar photos in the 35mm section are from a different year. Under the D006 heading, which is my folder number specifically for Fitzgerald Park pictures, the below image is photo number 10,000. Nice that it worked out that way, since it is one of my favorites as well. Taken on September 9, 2008 as the summer was winding down, I think it is one of the most beautiful shots of the pond (by the Nature Center) I have ever taken. Visiting the summer pages will show a significantly different looking pond in other years. This image serves as a link to those Summer (Late June thru Early September) pages. You might be wondering, if mushrooms, flowers, butterflies, animals, birds, and fish are all on other pages, what is left to be on the close-up page? Quite a bit actually, if you take the time for "A Closer Look." Use the image below left to get there. Then, right next to it, you can indeed check out mushrooms and fungi on their own separate page. I cannot always tell you which is which, but they are some of my favorite photo topics. Mostly Wildflowers (left), Insects (center), and Animals (right) are next up on the categories list. The below pictures serve as the first set of links to those topical pages. All three of the images are from 2004. I was still using my first digital camera through September 15, 2005 so the Kodak DX6340 was the camera used for these photos. The next Fitzgerald shots in my inventory (after that 9/15/05 date) are not until August 30, 2006, when for a short time I was using a refurbished Kodak DX7440 camera I purchased online from the Kodak website. I had dropped and broken my DX6340 and needed an interim camera while I shopped for a new one. By September 26, 2006, I had purchased my Canon Power Shot S2 IS, which is still my primary camera. The Canon has recently been having some problems though, so I might be shopping for a new one any day. I also continue to use the Kodak (DX7440) as a back-up, or when I want something smaller to carry. November 2013 camera note: I indeed ended up replacing my primary camera with a Canon SX1 IS. My Kodak also broke later and my (smaller hand held) back-up is now a Fujifilm Finepix F500EXR. Even though it is a very small camera, the Fuji has a 15x optical zoom, so I often carry it when exercising on the trails. Do Not Miss Miscellaneous (left) and Water Over the Dam (right) round out the categories list. The two photos below serve as the first set of links to those final topical pages. They also pretty much wrap up this page except for the quoted text following them. I decided not to overload this opening Fitzgerald Park Scrapbook Photos page with pictures, but use it simply as a starting point to access the twelve primary category pages. "Migrant Indian tribes led by the famous Chief Okemos called this area 'Big Rocks.' They came here in early spring to tap the sugar maples. Later, the beauty of the ledges and woods attracted the Grand Ledge Spiritualist Camp Association, which, in 1894, established a summer campground and erected the large pavilion (big red barn), which still stands. Thousands of spiritualists came here for summer encampments until the turn of the century. In 1919, the property became a public park known as Riverside Park. The park’s name was later changed to commemorate Grand Ledge native Governor Frank D. Fitzgerald who died in office in 1939. The pavilion was refurbished as a summer theater by the Grand Ledge Improvement Association in 1955." Are you asking yourself, with all of these pictures of Fitzgerald Park, where are the ledges that gave Grand Ledge its name? Certainly the park must have some of the ledges within its borders? And, indeed it does. But I have almost as many pictures of the ledges as I do of the park. "The Ledges" is one of the first Scrapbook Photos sections I did. Much like this one, it has been added to in stages. For your convenience, among the following links there is an option to go to the Fitzgerald Park ledges page I created when I did these pages.